Product Development: Are Frozen Meals Starting to Thaw? Home / Articles / 2011 / Are Frozen Meals Starting to Thaw? The frozen meals category has had a tough couple of years. Seemingly poised at the confluence of convenience and value, and benefiting from cost-conscious consumers who were eating out less, the $5 billion category (actually a subcategory of all frozen foods) nevertheless saw sales declines in the past two years, according to Mintel International. "Shoppers may be opting for shelf-stable meals and meal kits, as well as prepared supermarket meals they can eat as is, or to which they can add their own ingredients," says a September 2010 Mintel report on the category. "These are also convenient ways to get a meal, which undercuts one of frozen meals' major benefits. Although frozen meals have evolved significantly from "TV dinner" days, this perception may be holding the category back, the report continues. "Manufacturers have been fighting this negative image by developing premium lines of meals and co-branding with popular restaurant chains." Indeed, one of the few bright spots in the category has been bagged dinners for two, or skillet dinners. Unilever's P.F. Chang's dinners, launched last year, built on Unilever's 2005 groundbreaking Bertolli launch. Nestle USA made a similar debut with its Buitoni entrees in 2010. Ditto for General Mills' Wanchai Ferry. Stouffer's, long the leading name in this category, joined the bagged dinner-for-two fray just this spring with Stouffer's Sautes for Two. Although not a bagged dinner, Stouffer's Farmers' Harvest line emphasizes the natural and simple with ingredients such as sea salt, olive oil, cheese whole grains and vegetables. Most grocers' frozen food cases look like Yellow Pages listings for restaurants, with the likes of TGI Fridays, Marie Callender and California Pizza Katchen, as well as the new P.F. Chang's. But the Stouffer name, owned by Nestle since 1973, remains far and away the category leader, with frozen entrees, side dishes and new skillet dinners. The reason for all the interest is simple: "Nearly three-fourths (72 percent) of Americans eat frozen foods," says Tim Webert of Cargill's Convenience Foods Marketing group. Meanwhile, "Consumers and regulators are driving change towards higher value, more convenient, healthier nutrition (lower calories, sodium, fat), and restaurant-quality products." As Webert's business unit name implies, a good approach to improving frozen foods "is through cross-functional (marketing and technical) category teams, which drive customer-focused innovation by integrating ingredient expertise, category-specific marketplace knowledge and global technology capabilities … to make formulation decisions that impact frozen foods and help customers differentiate their brands," he says. How do you bridge those seemingly contradictory but powerful trends, all-natural and convenient? Frozen foods satisfy so many demands -- convenience, time pressure, portion control, exotic flavors and individual tastes and dining times – but they appear to many consumers to be about as far from natural as you can get. It's that TV dinner image. That's not at all true, of course, but it's just one of the image problems frozen food manufacturers are facing. With the convenience and speed of the microwave oven, there's no going back for consumers. But there's also a perception that fresh or at least chilled/prepared foods are healthier, more natural. How to merge the two? Following in the steps of some other food processors, who have turned chocolate, Spam or "the world's largest ice cream plant" into tourist attractions, Turkey Hill Dairy opened The Turkey Hill Experience on June 4, 2011. The ice cream and iced tea exhibit will be another attraction for Lancaster County, Pa., which already is known for its Amish population, the Pennsylvania Dutch. The dairy, which is owned by Kroger Cos. and headquartered in Lancaster, Pa., built the attraction in a restored former silk mill in nearby Columbia, Pa. The building had been deserted for more than 25 years. The Experience has more than 20,000 sq. ft. of exhibits, interactive activities and dining attractions. It tells the story of dairy culture in the mid-Atlantic region and of Turkey Hill Dairy, which claims to be the nation's fourth-best-selling ice cream and top selling refrigerated iced tea brand in the nation. See www.turkeyhillexperience.com. For many consumers, it comes down to the ingredient statement. "The consumer trend of demanding clean ingredient statements is as strong as it has ever been and is rapidly growing to include more and more consumers," says Jerry Shafir, CEO of Kettle Cuisine (www.kettlecuisine.com), Chelsea, Mass. Although he founded the company on fresh soups for restaurants and foodservice, he began to offer consumer products in 2006 and thought frozen was the best way to deliver them intact. One big reason for the growth of that trend is the "foodie revolution," Safir believes, which has been driven by "the recent explosion of broadcast food, eating and cooking programming as well as the online blogging community. "Consumers are more educated about food and are more interested in truly understanding everything they consume," he continues. "There is a new passion for learning about the story of the food we consume - where the ingredients came from and how they all came together in a finished product. 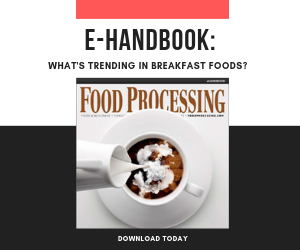 As a result, consumers only want to see ingredients that are real and recognizable - they shy away from foods that contain artificial ingredients or ingredients that are overly processed." The high-shear, heat, pH, freeze and thaw cycles are hard on frozen entrees. Starches have long been the processing aid that maintains texture and visual appeal. But native starches don't handle those conditions well. And the word "modified" in front of the word "starch" scares away some shoppers. Fortunately there are functional but natural starches, which are not chemically modified, that can maintain visual and organoleptic properties while looking "clean" on an ingredient statement. "Consumers that do read labels are looking for fewer but more familiar ingredients, like they'd see in their own pantries," says Bob Allin, director of marketing at National Starch (www.foodinnovatioin.com), Bridgewater, N.J. Novation is a range of starches from National Starch that maintain product integrity from plant to freezer to table. All that needs to be declared is the type of source starch: corn starch, rice starch, tapioca starch, etc. The key is hydropropylated or hydroxypropylated starch, formed by the reaction of starch with propylene oxide. This modification improves the shelflife, freeze/thaw stability, cold-storage stability, clarity and texture properties of the starch paste. Hydroxypropyl groups are hydrophilic in nature. When they are introduced into starch granules, they weaken the internal bond structure holding the granule together and also prevent water separating from the starch paste through syneresis. "We already have a good lineup of starches, waxy-based hydropropylated substitution," says Doris Doherty, senior food scientist in the technical services group at Tate & Lyle (www.tateandlyle.com), Decatur, Ill. "Along with stability and protecting texture, they will not remove any water during frozen storage." Texture, of course, is important. "We need to work with the customer to identify the desired texture – short and cut-able vs. creamy/viscous. Then we hone in on the correct starch or even a blend of starches." MiraSperse 2000 is the most highly substituted HP starch on the market; "It's very suitable for frozen foods," adds Mike Dail, Tate & Lyle's product management director for texturants. "It's designed to hold water, so it resists moisture loss during freezing. There will be no freezer burn; the cooked product will have an appropriate level of water; and the taste will be fresher, too," he says. Shafir of Kettle Cuisine adds: "Our Executive Chef Volker Frick has always said that our ingredient statements need to read like recipes and not chemistry experiments [and] that our customers need to be able to pronounce and recognize every ingredient."